Green-edged acrylic looks like glass, without the high cost. 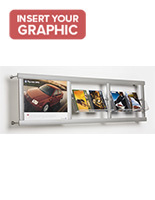 Combination brochure holder and graphic frame will increase distribution. 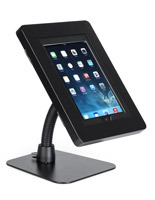 This literature dispenser is great for any heavily-traveled, indoor environment such as a shopping center or office building. 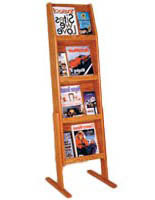 Tourist attractions would also greatly benefit from using this publication rack. The multi-functional sign holder, literature dispenser is a combination of a graphic frame and a brochure display, all in one fixture! 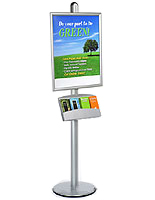 This literature dispenser, also known as a brochure display, has a 24"w x 36"h poster area and includes (2) green-edged, acrylic pockets for distributing brochures or pamphlets. Its large graphic area will grab an audience's attention, while literature handouts will leave a lasting impression upon new clients. Our pamphlet holder is a double-sided literature dispenser! 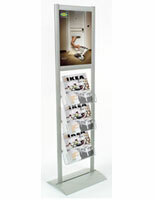 We provide the literature dispenser with (2) clear, plastic lenses to keep posters in place and protected. It also allows you to showcase graphics in both directions, doubling your exposure! 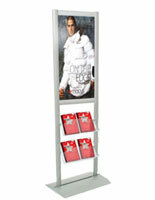 This literature dispenser is constructed from brushed aluminum and has a beautiful, silver finish. 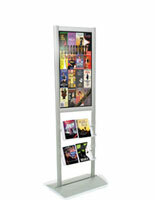 This leaflet display, literature dispenser is therefore rust-resistant, when used properly indoors. 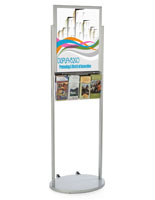 This literature dispenser, such as our other floor-standing display fixtures, will help draw more attention to your distribution materials. Please Note: Graphic is not included with display frame. When designing your images, keep in mind the actual graphic size is 24"w x 36"h, where approximately 1/2" on each side is covered. Your graphics should be printed on regular poster paper, so as to ensure they will fit securely within the grooves. Any printing service facility should be able to assist you.